Home / Family Life / Do you have the right tools to grill this Spring? Do you have the right tools to grill this Spring? I love when we have a cookout it does not matter what is on the grill, hot dogs, ribs, chicken, even veggies, something about it cooking outdoors over an open fire just makes all food taste better. I do not however like using horrible spatulas, and tongs on the grill. If you want to get burned you can do it very easily just by using the wrong tools. I love Cave Tools for the grill, they are strong and long enough to reach all edges of the grates and they are so easy to clean. 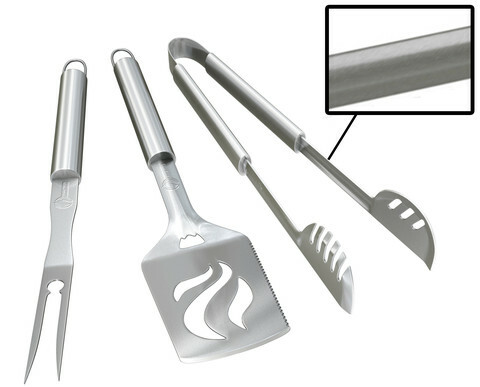 These are heavy-duty BBQ tools they are not the flimsy things you will find at the big box stores. 20 percent thicker stainless steel lends itself to never having to worry about losing any kind of meat to coals. These tools hold fast to whatever it is you are cooking. If you have ever had your dinner fall from a less than adequate tool, you will appreciate how well these are made and how heavy they are. I have some good utensils that I can use while grilling, but none of them besides my Cave Tools are dishwasher safe. The spatula, the meat fork and even the grill tongs just go right in with the rest of my dishes and come out beautiful and clean, ready for my next adventure. When the spring weather starts to get warmer and especially as summer arrives, you are going to want to have all of the right tools for the job. Parties will be planned and friends gathering, waiting and watching you cook delicious foods on your grill. Don’t disappoint by using the best tools you can buy, our food is only as good as the ingredients and I think that includes tools. One of the features that I love about the Cave Tools Spatula is that it has a bottle opener built right into the handle, this has saved me many times from walking all the back to the kitchen for one of my guests to open a bottle. Of course one of the greatest things about barbecue’s is you can try your hand at new and delicious recipes, Cave Tools even has that covered by sending you a free book with 25 recipes, for sauces, ribs, chicken even kabob. We all love new recipes! When you order and use the Cave Tools, you are 100 percent covered, if these do not live up to your expectations, you can return them and they will make it right, no questions asked. No many companies stand behind their product like that anymore, but these work so well you wont ever have a problem. You can buy these at their WEBSITE or pick them up at Amazon, you wont be sorry when the weather heats up and you are ready to fire up that outside grill! If you purchase at Amazon you can use coupon code FWOBWJHP and receive 15% off your purchase. You can connect with them on any of their social channels below, where you can see all of their products for great grilling.